Uppsala Cathedral is a mix of Gothic styles (essentially a neo-Gothic brick imitation of a French style) erected around a medieval base. It was ordained in 1435. This church is one of three largest in northern Europe and the largest in Sandinavia. It stands 118.7 meters (389.4 feet) long and the same from base to steeple tops at the west end. The largest of its bells, named Storan, is Sweden’s largest church bell. It is estimated that some 500,000 people visit the cathedral each year. Among the cathedral’s holy treasures is the gilded shrine of Erik the Holy in a side chapel near the high alter. Gustav Vasa and Carl Linnaeus are buried in the cathedral as well. At the southern entrance are a set of stone figures from the 1300’s and above them the largest of the stained glass windows spanning a total of 119 square meters (1281 sq ft). The bishop’s seat in Uppland was located at Gamla Uppsala until a fire in the cathedral there prompted the pope to grant permission to move the bishop’s seat to ‘New Uppsala’ (Östaros). Plans for the building were made in 1258. The founding of the new cathedral took place in 1273 and the French stone master Etienne de Bonneuil was it’s planner and chief architect. He was likely not the only one as stone masters from all over Europe were called in so the cathedral would not look shabby and outdated by visiting foreigners. It also had to be adapted to the cold climate. Work went slowly and with many pauses in part because of epidemics of the Black Death. An unstable political situation with frequent power struggles did not help. The towers were not finished until sometime in the 1500’s. Those were struck down by lightning and in 1619 were replaced with even more lavish spires. In 1702, a fire which burned through most of Uppsala devastated the church. Architect Carl Harleman led it’s restoration. 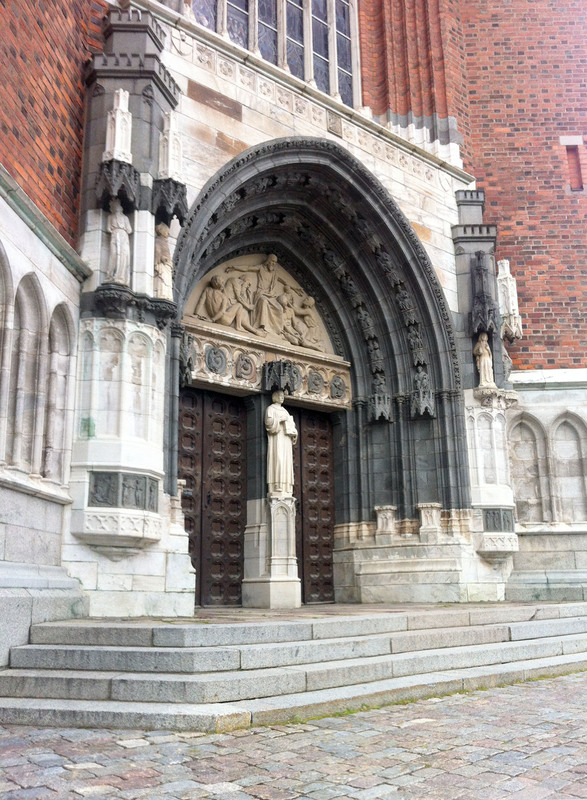 The cathedral again went extensive renovations in 1886 – 1893 led by Heldo Vetterval. He demolished the western portion and the towers and virtually all the interior and exterior cladding.